Studio 128 is proud to offer this year´s ArtsRageous Summer Camps! See National Geographic´s film "Science Fair" with Marcus Harston, SSVEC YES Fair Director speaking about how involvement in the science fair experience can bring vast benefits. Willcox Theater and Arts hosts this film to benefit WHS students attending Science Fair and other STEM programs. 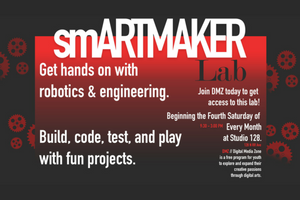 smARTMAKER LAB is your place for everything tech from coding, electronics, 3D design, assembly or ??? These are the coolest projects from robots to wearable art, so come and flex your tech muscles. A Sensory Friendly Theater Experience, with lights turned up and sound turned down. Children are encouraged to be themselves in an accepting environment.